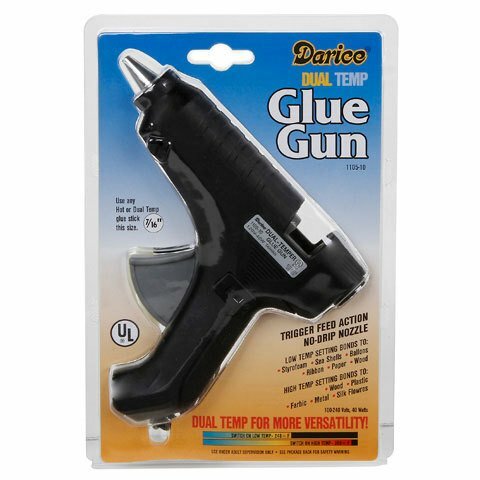 Dual Temp Glue Gun - Dual Temp for more versitility! 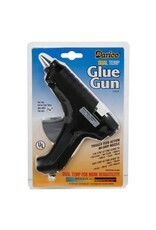 Handheld glue gun for use with 7/16in. glue sticks (sold separately). Low-temperature setting works with Styrofoam, shells, ribbon, paper, and more. High-temperature setting for use on magnets, wood, metal, and plastic. Trigger feed; drip-free nozzle; comfortable cool-touch handle; UL listed. Measures approximately 7in. x 1-1/2in. x 7-1/2in.